Grid tied solar power systems allow you to reduce your electric bill by sending extra electrons produced sent back into the grid which you recieve credit for. Traditionally, an electrican would hook up a grid tied system to your utility’s service box so your system can interact with the grid. Today, through inverter innovation, it is now possible to plug in an inverter right into a AC outlet and push electrons back into the grid, which reduces your bill. 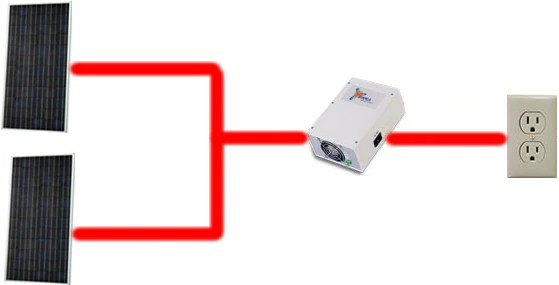 The SWEA 250 grid tied inverter features an AC Output which can be pluged directly into a socket. Just connect two 130 watt solar panels to the inverter and plug it into the wall. The special inverter allows renters, people who live in apartments or condos to be able to plug right into the grid. The GoGreenSolar.com Plug N Play Solar Kit is truly small scale solar power appliance that can help reduce your electric bill. Multiple kits can be put together to create a larger system which have a larger net impact. We believe this solar power kit will significatally reduce the cost and installation barriers traditonally consumers face when considering a grid-tied system and help more people to get their feet wet with small scale grid tied solar power.